Whether challenged with taking on a startup, turning a business around, or inheriting a high-performing unit, a new leader’s success or failure is determined within the first 90 days on the job. In this hands-on guide, Michael Watkins, a noted expert on leadership transitions, offers proven strategies for moving successfully into a new role at any point in one’s career. 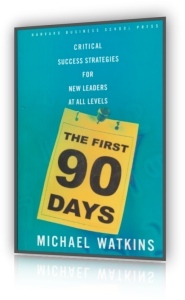 “The First 90 Days” provides a framework for transition acceleration that will help leaders diagnose their situations, craft winning transition strategies, and take charge quickly. Practical examples illustrate how to learn about new organizations, build teams, create coalitions, secure early wins, and lay the foundation for longer-term success. In addition, Watkins provides strategies for avoiding the most common pitfalls new leaders encounter, and shows how individuals can protect themselves-emotionally as well as professionally-during what is often an intense and vulnerable period. Concise and actionable, this is the survival guide no new leader should be without. Play or Change the Game? The rules for making good people decisions are well established, though, alas, very few of us follow them correctly. Any executive who starts out by believing that he or she is a good judge of people is going to end up making the worst decisions. To be a judge of people is not a power given to mere mortals. Those who have a batting average of almost 1.000 in such decisions start out with a very simple premise: that they are not judges of people. They start out with a commitment to a diagnostic process. People decisions are the ultimate—perhaps the only—control of an organization. People determine the performance capacity of an organization. No organization can do better than the people it has. It can’t reasonably hope to recruit and hold much better people than anybody else, unless it is a very small organization, let’s say a string quartet. Otherwise it can only hope to attract and hold the common run of humanity. The quality of these human decisions largely determines whether the organization is being run seriously, whether its mission, its values, and its objectives are real and meaningful to people rather than just public relations and rhetoric. Properly done, the selection process starts with an assignment not merely with a job description but an assignment. Next, the executive forces himself or herself to look at more than one person. All of us think we know who the “right” person is, as a rule. But effective non-profit executives shouldn’t decide impulsively. They should look at several people so they have a safeguard against being blinded by friendship, by prejudice, or merely by habit. Thirdly, while reviewing candidates, the focus must always be on performance. Don’t start with personality. Don’t start with the usual silly questions such as does he get along with people, or does she have initiative? These characteristics may be meaningful in describing a personality, but they don’t tell you how people perform. The right questions are: How have these people done in their last three assignments? Have they come through? Then, fourth, look at people’s specific strengths. What have they shown they can do in their last three assignments? Once you come to the conclusion, yes, Mary Ann is the right person, go—the final step—to two or three people with whom she has worked. If they all say, My only regret is that Mary Ann no longer works for me, then go ahead and make the job offer. But if they say, I wouldn’t take her back, start thinking again. Selecting a person to carry out an assignment does not end the decision process. The second stage comes ninety days later, when you call that newly appointed person in and say: Mary Ann, you have now been on this new job ninety days. Think through what you have to do to be successful, and comeback and tell me. When she returns with her report, you can finally judge whether you have selected the right person for the assignment. And fifth, once the decision was made, Marshall made sure the appointee understood the assignment. Perhaps the best way to do this is to ask the new person to carefully think over what they have to do to be a success, and then, ninety days or so into the job, have him or her commit it to writing. Although this is the last step in making people decisions, it may be the most important. If you fail to accept this responsibility of making sure that the appointee understands his or her new job, do not blame the new person if he or she ultimately fails. Blame yourself, for you have failed to do your duty as a manager.